The conservation of biodiversity is inescapably linked to taxonomy and systematics, the branches of science dealing with the identification, naming and classification of organisms. If there is no reliable and correct name (and therefore no associated description) for a given organism, that organism cannot be identified. Furthermore, it cannot be meaningfully recorded in a biodiversity inventory or assessment, nor can it be protected. And it is estimated that there might be several million living organisms that have yet to be named and described.1 If the name by which an organism is referred to is wrong, being, for example, a name that corresponds to another organism, the validity of all subsequent studies on it, and in which it is included, must be questioned. Also, without access to the correct names of organisms, it is not possible to conduct any meaningful comparative studies or analyses. Names of biological entities have types - a type being a specimen to which the name of a taxon is permanently linked - and therefore types are particularly important to taxonomists. Without access to type material, it is not possible to undertake comprehensive taxonomic revisions, as one of the aims of such a study is to clarify the classification and, by implication, the correct names of organisms. Types not only serve to fix the use of a name, but are also used as essential reference material in working herbaria, where identifications are done routinely. Identification is an important activity of taxonomists operating from herbaria that provide such a service. Even though types often hardly qualify as representative of the appearance of a species and should be treated and handled with great care, in the absence of other material (for instance, for rare species that are only known from type collections) type material is inevitably used for identification purposes. In spite of the importance of types, information on their identity and location is often difficult to trace, even for an expert who knows where to look for them. What is unknown to many people is that the types of new plant names are not always kept in the country in which they were collected. It is not uncommon that a plant that is endemic to a particular country (i.e. not occurring anywhere else) is known from a single collection (the type specimen) and that that specimen is kept in a different country. This situation is often encountered with respect to type specimens of African plants. As part of a recent revision of the family Rubiaceae in Angola,2,3 we compiled a dataset of collections that included information on all the types in that family collected in Angola. Most of these are kept in Europe, which led us to investigate the location of the remaining types of Rubiaceae occurring in Angola. The results of this investigation are discussed below. The Rubiaceae (the economically important coffee family) is the fourth largest flowering plant family in the world, with more than 13 000 species in 611 genera4 that occur predominantly in the tropics. In the whole of Europe, there are only 14 genera and 287 species,5 while in Angola there are 108 genera and 422 species.3 Of the 464 taxa (species, subspecies and varieties) of Rubiaceae thus far recorded in Angola, 448 have a distribution restricted to the African continent. Using a recent taxonomic revision of the family in Angola2,3 and a few online facilities, namely the Aluka6, Tropicos7 and Botanicus8 databases, we compiled information on the types (paratypes excluded, see Box 1 for categories of types) of these 448 taxa. Even in these new dedicated websites, information on types is often difficult to find and it is frequently incomplete, contradictory or patently wrong. By making use of these online resources we could not determine the type collections for 25 taxa in our sample (ca. 5%), as neither the name(s) of the collector(s) nor their collecting numbers could be found. For the remaining 423 taxa, the holo-/neo-/lectotypes were determined for 289 taxa (ca. 70%), while, for the remaining taxa, we recorded syntypes, or syntype collections where no lectotype was designated. The most striking outcome of our investigation was that for 430 taxa (96%) the actual type (holotype, lectotype, neotype or syntypes), or its duplicates, was deposited in European herbaria. This figure includes 13 types destroyed in Berlin during WWII, with the existence of duplicates being unknown. If the remaining 4%, for which types were undetermined, fall in this category, the figure may even reach 100%. The country where the most types are deposited is the United Kingdom (with types or duplicates of 312 taxa), followed by Portugal (127), France (99) and Belgium (71). Only 50 taxa (ca. 12%) have type material represented in African herbaria; this is a representation by duplicates, as not a single holo-/neo-/lectotype was recorded from Africa. Furthermore, of the 87 taxa that are endemic to Angola, only 18 have a duplicate of a type specimen housed in Africa and, of these, only seven are recorded as having a duplicate in an Angolan herbarium. This is not due to a lack of duplicates of the type collection; for 50 of these endemic taxa, the types are represented in three or more herbaria. It just so happens that these herbaria are all located in Europe. It is also remarkable that some types have several undistributed duplicates in the same herbarium. For example, the type of Pentaloncha rubriflora R.D.Good, a rare species endemic to Cabinda that was collected only once, in 1903 - the type collection - is represented in five herbaria: two in the United Kingdom and three in Portugal. However, as observed in Aluka6, one of the Portuguese herbaria has five duplicates of that collection, while not a single duplicate is recorded as being kept in Angola, nor in any herbarium in Africa. The absence of duplicates in Africa means that, to see a type, an Angolan researcher would have to travel to another continent instead of visiting a neighbouring country. The reasons for this situation are, of course, historical, as the countries that hold most of the collections from tropical and southern Africa are their former colonial powers: Belgium, France, Germany, Portugal and the United Kingdom. The types of most African plant names were collected during early expeditions undertaken by European botanists and collectors, their collections having been shipped or carried back to Europe and usually deposited in a herbarium of the former colonial power. In our Rubiaceae example, the collector who contributed types for the largest number of taxa (77) was Friedrich Welwitsch (1806-1872), one of the most prolific and important collectors in tropical Africa, who undertook expeditions to Angola over a 7-year period. His collections are mostly housed at The Natural History Museum (BM, United Kingdom) and at the University of Lisbon (LISU, Portugal), but duplicates are found in a further 20 herbaria.9 Of these, only two are African and none is Angolan. The other significant collector in Angola, who contributed types for 69 of the Rubiaceae taxa, was John Gossweiler (1873-1952). He lived permanently in Angola and sent his collections to Europe, mostly to England (to BM and Royal Botanic Gardens, Kew) and Portugal (to the University of Coimbra, the Centro de Botânica in Lisbon and LISU), but some duplicates were also kept in Angola (at the Herbarium of the Instituto de Investigação Agronómica). During the two previous centuries, the taxonomy of the African flora (particularly tropical and southern) was studied mostly in Europe, in the great centres of tropical plant diversity research of the time: Berlin, Brussels, Lisbon, London and Paris. It was there that the major African regional Floras were initiated, research for them conducted, published volumes produced and where material (types and other collections) was needed for taxonomic research. 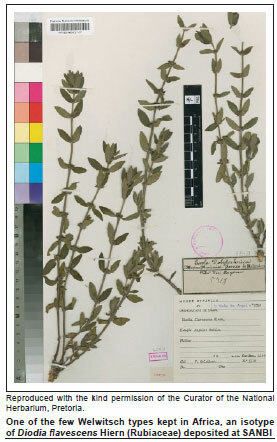 Recent African collections housed in European herbaria (i.e. from the last 30 years) are not due to historical reasons, but are mostly a result of contemporary activities. In fact, the bulk of the research activity in tropical African plant taxonomy is still taking place in Europe. One reason is that research is more easily conducted where the material, source documents and other research resources are available. If they are unavailable locally, then a large amount of funding will be necessary to facilitate the access to those resources in other countries. Building capacity in Africa by sending students to Europe or further afield to obtain higher degrees and training, will not always have the desired outcomes if, on returning to their countries, these eager, new taxonomists lack the means (i.e. collections, types and literature, not to mention other facilities, including laboratories and reliable internet access) to further pursue their studies and research programmes. They remain dependent on European institutions, having to travel there to examine biological collections and literature, or have to rely on the goodwill of European colleagues to provide information or fill in research gaps. Has the increasing availability of electronic images of type (and other) specimens made a difference? The highly commendable African Plants Initiative10 is a prime example of how to facilitate access to hitherto 'hidden' African material. The 'taxonomic impediment', that is, the lack of taxonomists and tools that can be used to identify undetermined specimens, as well as difficulties in accessing associated organismal and biological information, has been much discussed in the literature.11 This impediment and the general lack of funds for taxonomic endeavour are global issues affecting most countries and are usually inversely proportional to the country's economic development. In most of Africa, as in other economically less developed parts of the world, taxonomy is (perhaps understandably, but regrettably) not a priority for funding agencies or governments. Worldwide, taxonomists have to deal with the lack of institutional and public support. However, in Africa, the colonial past has left an extra impediment: the almost total lack of types and a wide range of historical plant collections. The term 'repatriation' is an obvious solution to this problem. But what is meant by this? 'Data repatriation' or 'data sharing' are oft-used terms in research proposals and applications for funding in Europe (and elsewhere, of course), as they not only touch the nerve of European guilt over the erstwhile (over) exploitation of colonies during imperialism, but also the still lingering feeling of the 'White man's burden': the supposed, or presumed, responsibility of White people to govern and impart their culture to non-White people, often advanced as a justification for European colonialism.12 Repatriation invariably means standardised data repatriation and not repatriation of the actual physical collections. Decision-makers and politicians reason that repatriating data associated with the collections (basically high-quality digital images and databases containing standardised content derived from label and other specimen information) is the solution for the remaining colonial legacy in in-country natural history collections. For example, the Aluka website includes high-quality images of an astonishing ca. 278 000 specimens of African plants, largely from European herbaria. Data repatriation is very useful and profoundly informative for taxonomic studies, but taxonomists often require more. Ideally, taxonomists need to examine the specimens and observe details that are not visible in images. For taxonomists, physical access to specimens is crucial: an electronic image of a physical specimen cannot, and never will, replace the specimen itself as a primary element that can be dissected (if allowed by the owner-institution) and analysed. Furthermore, considering the lack of adequate access to the Internet and electronic storage facilities, such as high capacity servers, in many African countries, these online methods of data repatriation may serve mostly the needs of European researchers. The actual repatriation of specimens is not on the agendas of decision-makers and it is rarely mentioned or discussed. As with any idea or paradigm that implies a substantial change of the existing system, when the suggestion of repatriation of collections is made, it meets a barricade of disapproving voices protecting the status quo. The arguments put forward by these voices mostly focus on practicalities (Where? How?) and speculations (What if?). Curiously enough, higher-level and more complex issues, such as principles, rights of ownership and IP rights, are seldom mentioned. In our view, the truth is that the concept is thorny for both sides. On the European side, if specimens are repatriated, the future of the institutions that hold them may be jeopardised. For example, some so-called northern institutions are exclusively dedicated to tropical research, and employ highly specialised researchers. What will they have left to do if specimens collected from their former (tropical and subtropical) colonies are en masse returned to the countries of origin? On the African side, if millions of specimens arrive from Europe needing proper infrastructure, preservation and dedicated staff, one could question where they will be kept, who will curate them scientifically, and who is going to pay for their maintenance? As it is, retaining the status quo and opting for the politically correct approach of data repatriation, Africa avoids the expense and many European scientists keep their jobs. Presently we witness the frustration of young African taxonomists who are unable to sometimes even initiate, not to mention maintain and expand, the work for which they are qualified. In addition, there are some moribund European institutions, the residues of former imperialist glory, which barely survive, without functioning budgets or staff, where valuable African specimens are deposited uncurated and unused, running the risk of slow, inevitable decline, if not decomposition. African plant taxonomic studies in many countries in Europe are reaching their end. For decades, these studies were mostly kept going by former colonialists who continued the work they had been doing in the former colonies before these became independent. Many of these researchers are now retired, or about to retire, and what sense does it make to have a generation of new taxonomists (an endangered breed, as it is) devoting their careers to the floristic studies of foreign countries, when there is much to be done in their own country? Going back to our example of Portuguese collections, it is conservatively estimated that the country holds ca. 500 000 preserved African plant specimens. These specimens (or at the very least, their numerous undistributed duplicates) would undoubtedly be more useful in the countries from which they originated, where they could serve as a basis for the local production of Floras and monographs and motivate capacity building in plant taxonomy. European (and African) taxonomists are aware of this but the case for repatriation of collections is rarely made, because of its implications for their own institutions, careers, and, often, their (donor) research funding. It is time for the past colonial powers to increasingly work with the plant scientists in their former colonies to determine how best to sustainably advance the sharing of data gathered from specimens, and other sources, originating from the colonies and also to discuss the possibility of specimen repatriation. The location of the bulk of historical African plant collections in the Northern Hemisphere should not be seen as an inevitability that cannot be changed. There are many examples of repatriation of other, non-biological collections such as human remains and cultural heritage objects. However, repatriation of biological specimens has never been adequately debated. It has been assumed that data repatriation in the form of images would solve the problem. Curiously enough, it has never been ventured that once the specimens are duplicated as images, the former could be repatriated to their original countries (the developing countries) while the surrogate specimens (i.e. the images) remain (in the developed countries). It has always been assumed that collections belong to the institutions where they are housed. A reason for this is linked to the complicated issue of ownership of biological specimens. Who owns specimens collected in other countries that at the time of collecting were colonies or so-called 'overseas territories'? Of course, there is a widely held view that Flora production is an outdated and slow approach to delivering taxonomic products, and little more than a consequence of colonialism. Still, which country, region or continent does not covet having a complete descriptive catalogue of their plant biological wealth? It must also be emphasised that there is a difference between a Flora produced locally and one produced ex situ by taxonomists who know the plants as herbarium specimens but often never saw them in the wild. Even though these 'armchair botanists' may be extremely competent, when the knowledge of a plant species is based only on preserved and colourless, two-dimensional specimens trimmed to fit herbarium sheets, it is probable that several obvious characters of that species are ignored. This is particularly relevant in plant groups such as the succulents. Identification keys that are based only on herbarium specimens may use obscure microscopic characters while omitting other diagnostic characters easily observable in living plants. Knowledge of the living plants allows for production of separate keys for the identification of both living and preserved specimens, as done for Aloe L. in Angola by Klopper et al.15 Floras should be easy to use by a range of clients and not only aimed at the specialists equipped with high-power microscopes. A Flora produced locally by taxonomists with a knowledge of their plants in the field is likely to be more functional than one produced in a faraway continent. This should be argued strongly by African taxonomists in their case for bringing African plant taxonomy back home. It can be argued that there was some investment in infrastructures in the colonies, but, in fact, even if herbaria and biodiversity institutes were created in Africa, European institutions always maintained a hold on their progeny-institutions. Duplicates of the collections could be left in Africa, but the 'best' (including type) specimens would go to the mother-institution. At present north-south projects where northern contributions empower the south are rare. In fact, in most cases collaborative projects aim at maintaining the status quo and the technical/scientific dependence on northern expertise, when they do not serve the purpose of providing employment for developed world experts. Equal north-south partnerships are even less common. One of the few examples of this kind of initiative in this area of activity is the Flora of Ethiopia16, a highly acclaimed project initiated in 1980 and often cited17 as a successful case of the use of external research funding locally with a high focus on capacity building. Such examples are likely to remain unusual while the basic scientific resources needed for research on African biodiversity are kept in Europe. It is our view that former colonial powers have a moral and scientific obligation towards Africa to return these resources. Now it is time for African scientists to express their needs and put their case forward.